Young Thad Moffitt will make his Pocono debut this weekend. At age 17, Thad Moffitt is on the threshold of his stock car racing career, learning his profession and dealing with school simultaneously. During the week the Trinity, N.C., teenager works at Mooresville, N.C.-based Empire Racing from 7 a.m. to 4 p.m., and then attends school online at night and while he’s at the race track. 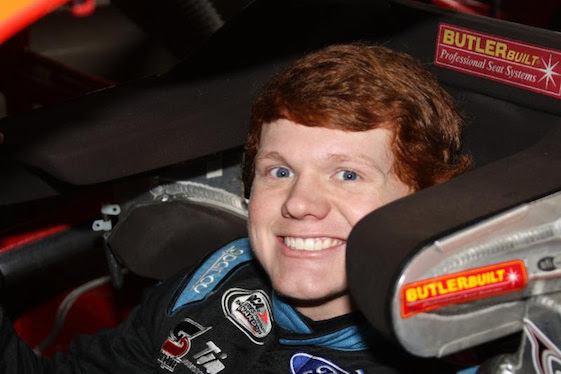 Even though the red-haired Moffitt is still learning race car construction, he already handles the media with maturity. Of course, when he smiles one understands his ease with which he handles public notoriety. It’s that familiar Petty smile. Moffitt is Richard Petty’s grandson; an aspiring driver who’s expected to earn his way in the sport and develop his own driving style. Moffitt has attended the Bondurant and Skip Barber racing schools, but has yet to add any dirt racing experience to his resume. It’s something he would like to do later this year or in 2019 in Modifieds and Micro Sprints. This weekend Moffitt makes his Pocono debut. It’s the first time the fourth-generation driver has competed on any track larger than a half-mile, and he turned to his uncle, Kyle Petty, for advice. “Grandpa didn’t have power steering for half of his career so a lot of the stuff that he says doesn’t really relate to the way the cars drive nowadays,” Moffitt continued. Moffitt believes there’s less pressure on him from media and fans because his last name isn’t Petty. However, he feels pressure to perform the way his family has performed in the past. His great grandfather, grandfather, great uncle and cousin are all NASCAR Hall of Fame members. Lee and Richard Petty possess a total of 10 NASCAR championships and 254 Cup victories. Moffitt said more people believe he’s related to NASCAR driver Brett Moffitt than Richard Petty. It wasn’t until 2010 at the Daytona 500 that Moffitt suddenly realized he could one day race in the prestigious event that his family’s race team has won nine times. The Quarter Midget was purchased when they returned to North Carolina following that event and suddenly baseball, football and basketball no longer interested him.